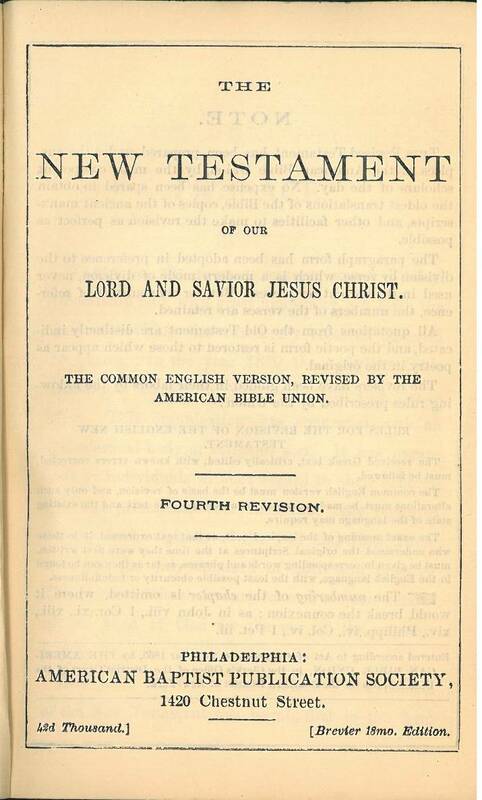 This Fourth Revision is not to be confused with the New Testament published with the complete Bible in 1912. The copyright is 1865 (which matches the copyright for the Second Revision), but the text differs in some small ways from Second Revision. One example is Matthew 3:1 which reads "John the Baptist" compared with "John the Immerser" in the Second Revision. The changes might be explained by a sentence in the preface reads: "The work was completed and first published in 1865, since which time many editions have been circulated with still further slight emendations." Title: The New Testament of our Lord and Saviour Jesus Christ. The Common English Version, Revised by the American Bible Union. Fourth Revision. Date: After 1883, copyright 1865.